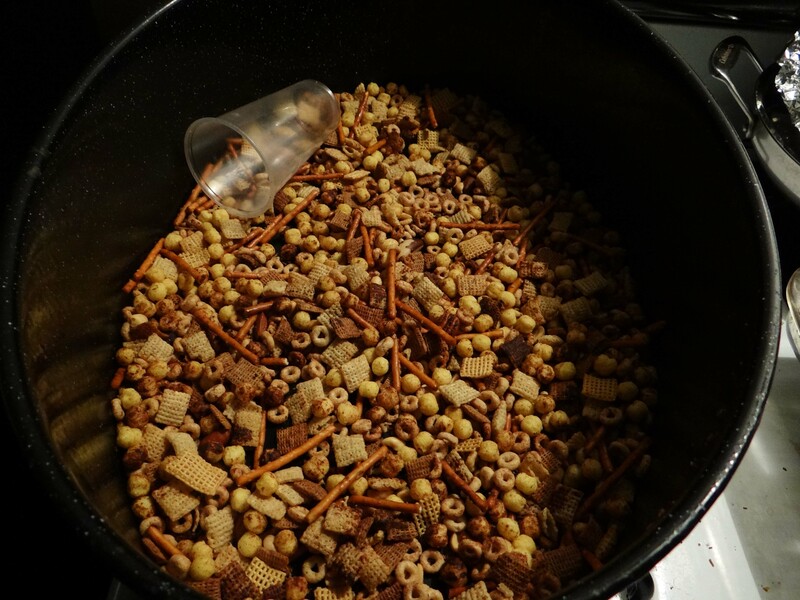 It began years ago with the recipe on the Chex cereal boxes. Then everyone’s grandmother added their particular additional ingredients. It took on different identities: nibbles, trash, Texas trash, and others. Cyndy’s mom’s recipe is for Texas Nibbles. Our daughter, Jennifer, fixed several different varieties: no nuts, hot, not hot, really hot – you get the idea. But the point is that – in any variety – the mix is addicting. It is the one thing left over that you don’t have to do anything for but grab a handful. No cutting a pie, no getting a plate dirty, no digging in the refrigerator. Just grab a handful. And it’s salty. We give containers of mix to the family for Christmas. We also usually receive a container from Jennifer. Naturally, this year was no different. But some things have changed. We still go to my parents on Christmas. But we don’t have a big meal anymore. Mom is not able to cook and serve the meal any longer. Cyndy and I take the Thanksgiving dinner to them – just dropping off food for them and visiting a short while. On Christmas day Mom and Dad buy snack trays and deli sandwiches. Cyndy, Conner, Cameron, J.D. and myself – often in more than one car – meet Jennifer, her husband, Chris, and their daughter, Kelley, at the grandparents house. This year, Chris’ daughter, Katherine, was able to join us. Rather than have the meal (usually brunch), we go straight to the gift exchange. Then we all get our stockings from the grandparents, snack a while, and visit. Visiting is the most important part. It is the part that does not and should not change. The people may change slightly from year to year due to life’s circumstances. But the family fellowship does not change. Our family is one that gets what they need throughout the year. We give gifts to each other all year. Christmas is not about the gifts. It is about celebrating Christ’s birth. And it is also about family – in all it’s facets. But the one constant between Christmas and New Year’s in our family is the presence of Texas Nibbles. The mix goes quickly around Christmas and then slows down to a steady rate of consumption. The salty after the sweet. Just grab a little and go kind of thing. I don’t know what Cyndy and I will be watching tonight while waiting on midnight. But I can tell you what we won’t be watching – the countdowns to midnight. I can, however, tell you one thing for certain. We will be eating Texas Nibbles from the bag I have stashed. Happy New Year! Peace be with you!